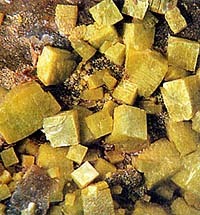 Most widespread yellow mineral in the Radio-active materials, the group of "uranium micas", Otenite is presented yellow crystals distinctly plate tablet lamellar forms with square outlines. For him very much perfect absolute cleavage, look like cleavage of mica, along bottom base. Colouring is greenish-yellow; Otenite gives fluorescence in a that colour gamut. By appearance look like inoffensive vermiculite, in-use for the improvement of soil of home plants. Uranium a radioactive silvery-white metallic element of the actinide series. 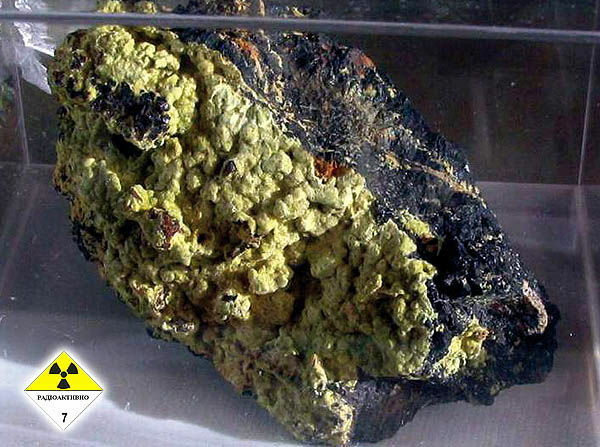 It occurs in several minerals including pitchblende, carnotite, and autunite and is used chiefly as a source of nuclear energy by fission of the radioisotope uranium-235. Symbol: U; atomic no. : 92; atomic wt. : 238.0289; half-life of most stable isotope, 238U: 451 x 109 years; valency: 2-6; relative density: 18.95 (approx. ); melting pt. : 1135oC; boiling pt. : 4134 oC. It radio-active mineral; in ultraviolet rays fluorescent a chlor color. At heating loses part of water and passes in metaotenite rhombic Crystal structure. Appears at the superficial changes of minerals of uranium. It is practically in all of his deposits. Kollekcionirovat' at home this mineral is not extremely recommended. 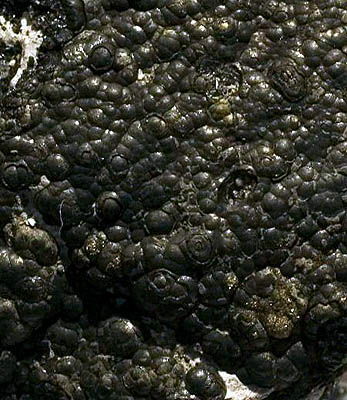 The best copies of Otenite are found in a mine near-by Spokeyna (the state is Washington, USA); known in Portugal (Urzherisa), Australia (Ram-dzhangl on North territory), in France (Sen-Simforen, Oten), on a peninsula Kornuoll (Sent-Ostell and Redrut). Otenite is not the object of booty except for rare cases: due to a capacity for fluorescence he finds application for the production of sources of ultraviolet light, in-use at searches deposits of uranium. Metaotenit. Connecticut, USA. Crystals to 8 mm. A photo: © A.A. Evseev. 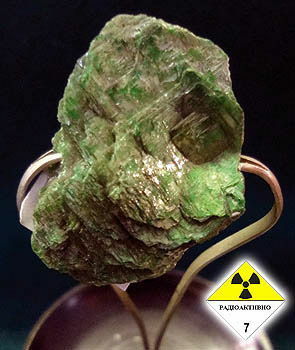 Uranophane (uranium mica). Velsendorf, Bavaria, Germany, EU. A photo: © A.A. Evseev. On the right. 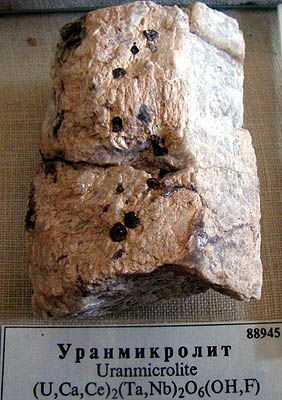 Uraninite (uranium resin ore). Mine 371, Khartenshteyn, Sakvsoniya, Germany. On the left. Uranmikrolite. Corvine tundras, Kolskiy (Kola) peninsula, Russia, CIS. A photo: © A.A. Evseev. On the left. 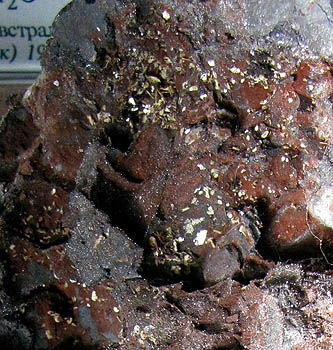 Uranospinit (uranium mica). Charkasar, Kuraminskiy mountain ridge, Uzbekistan. On the right. Uranocircit. Ore mountains, Saxony, Germany, EU. A photo: © A.A. Evseev.